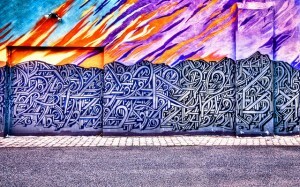 Graffiti is an art form that does not politely wait to be discovered. It does not ask permission but pushes its message onto an unsuspecting public. 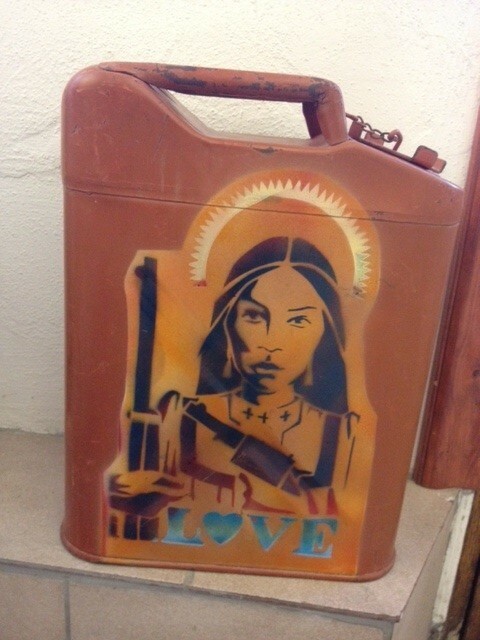 Considered as a political gesture, it is easy to see the appeal of graffiti for many Native American artists. 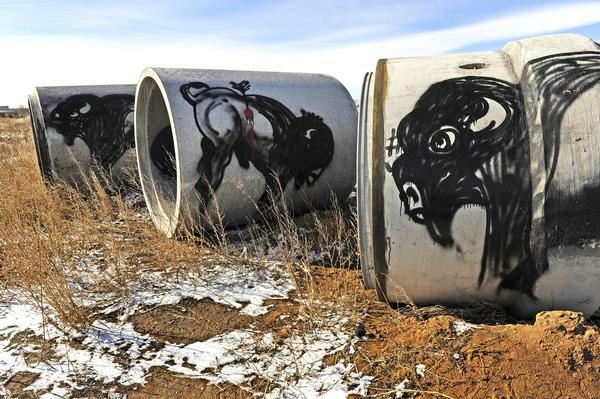 Graffiti is necessarily anti-authoritarian, as is the work set out for Native artists struggling to get their images past a white hegemony that prefers to take representation of Native culture into their own hands. Graffiti is first and foremost known to be an element of Hip Hop culture, but the use of spraycan paint in the public arena also has roots in punk culture. Some bands would apply spray paint over stencils to get their names onto street walls. 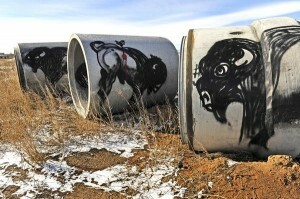 Some activist artists also took to illicit stenciling. One early artistic use of spray painted stencils to deliver a public message explicitly relate to Native American history. 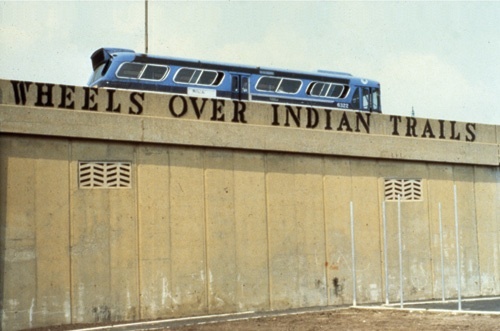 In 1979 John Fekner stenciled the message “Wheels over Indian trails” on the Pulaski Bridge Queens Midtown Tunnel in New York, in commemoration of the thirteen tribes that originally inhabited Long Island. 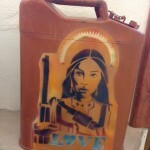 In the hands of Douglas Miles, spraycan art is infused with a Native punk sensibility all his own. His images are instantly recognizable, often combining stenciled figures reminiscent of comic drawing with written slogans, logos, and short, powerful messages. In the tradition of graffiti he paints on walls, but also on canvas, paper, skateboards, old briefcases, rusty oil cans, folding tables – anything he can lay his hands on really. In such an indiscriminating dissemination of his artistic mark, Miles evinces a spirit true to graffiti. And by repurposing discarded objects as art he shows that the objective of graffiti is to beautify, not – as the governmental outlawing of it maintains – to deface and vandalize. One might argue that by displacing a street medium such as spraycan art onto canvases and into galleries, Native culture’s engagement with graffiti today risks replaying the fate of graffiti culture in 1980s New York. When the art world caught up with what was happening on the streets, some gallery owners and agents tried to cash in by encouraging graffiti writers to transfer their art from subway cars and street walls to canvases. The results were often disappointingly, but perhaps inevitably, tame. It may not be the most self-serving thing for a gallery to state, especially when Kiva Gallery has many graffiti related art works for sale, but let´s face it: there will always be an aspect of resistance and subversion to graffiti that cannot be adequately conveyed within the confines of the gallery walls. However, for Thomas Breeze Marcus such concerns would seem to be of secondary importance. He is just as accomplished an artist on large public walls as he is in smaller format. This is in part due to the fact that his style takes inspiration from the aesthetic traditions of his tribal heritage. 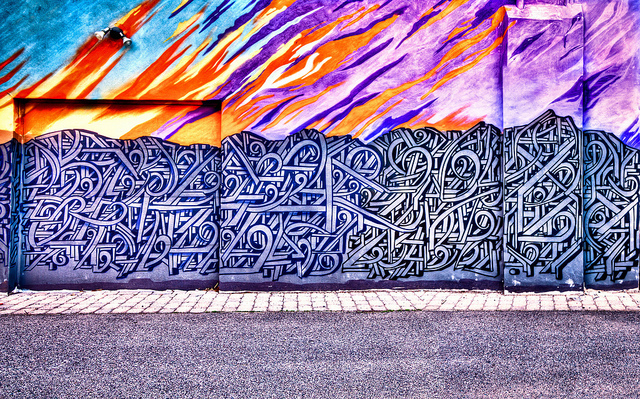 The incredibly intricate and interwoven designs of his paintings resemble the basket weavings of the Akimel and Tohono O’odham peoples, but also mirrors the most complex form of lettering in wildstyle graffiti. Through its very medium, spraypaint raises political associations of taking representational matters into your own hands as much as it does a particular aesthetic. Douglas Miles and Breeze Marcus have adopted graffiti as a way to deal artistically with specific concerns of their own cultures and in the end their commitment to it is as reinvigorating for the art of graffiti as it is for Native culture. Föregående inläggFöregående I listen to the gunfire we cannot hear..